Parody: The Greatest Form of Flattery? The parody has been around forever and in a variety of forms. From ancient Greek literature to songs about eBay from Weird Al, the world loves a good parody. But why do they work? Parodies really have been around for a long time. As far back as 335BCE in his work Poetics, Aristotle claimed that Hegemon of Thasos invented the first thing we could reasonably say was a parody by taking popular poems of the time and exaggerating aspects of them to make them ridiculous. They’ve taken many forms since then, including the Greek satirical plays (which are parodies of the classic Greek tragedy) and parody texts of The Odyssey and Indica by Lucian of Samosata. Once you hit the 20th century and the era of postmodernism, parody really takes off. The definition of parody broadens. Whether it was a song, poem or book, parody was first used to ridicule the original work. More and more often as time went on, though, parodies begin to lift essential elements of a work and apply them to a different situation without making fun of the source of the elements. In fact, the original elements are commonly used to poke fun at the new situation. These types of parody are the ones we’re used to seeing every day and have arisen from postmodern artists looking to connect with the past but acknowledge the situational difference brought about by modernisation. Enter the 21st century and the birth of the meme. Many memes use parody in both the classical (poking fun at the original work they are referencing) and modern (lifting elements from the original work and using them to poke fun at a different situation) sense. 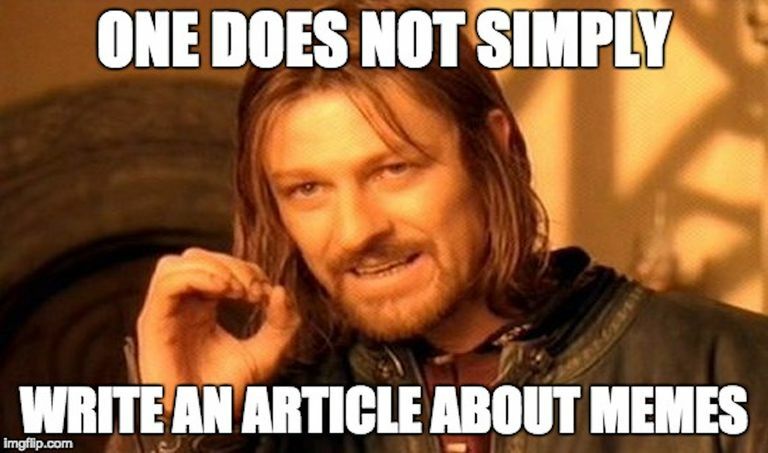 And there’s a meme for just about everything…including memes. 99.9% of parodies are funny (or at least are trying to be funny), which is why they tend to work, and what makes them relatable. These qualities are what give parodies their notorious reputation for being more well-liked (and remembered!) than the things that are being parodied. For example, do you remember Secret Army? Probably not. Do you remember Allo, Allo? Far more likely. Allo, Allo takes the story of Secret Army and just makes it ridiculous… and you can’t deny that Allo, Allo is just a little bit funny. In fact, the phenomenon of parodies becoming more famous than the thing being parodied has a name: The Weird Al Effect. Named after the famous parody artist, Weird Al Yankovic has made his living penning great parodies such as Another One Rides the Bus, I Bought It on eBay and Eat It. There’s also the admiration aspect to consider: the fact that someone is using another artist’s work to enhance their own shows a level of flattery to the original artist… or does it? Fair Use law generally protects parody creators from being prosecuted for copyright infringement, but because parody is so hard to define (where is the line between a copy and a parody? ), it often falls into the ‘I know it when I see it’ category of judicial rulings. It’s to be expected, though, that if your advert is successful enough, eventually someone is going to create a parody version you may- or may not- find humorous. Parodying ‘The Lynx Effect’ advert for the popular deodorant brand, Specsavers decided to show us just how important it is to get the right specs…because deodorant alone just won’t cut it. The original work, ‘Balls’ for Sony, is, in my opinion, a piece of advertising genius. The visuals are striking and the juxtaposition with the relaxing sound track gives the original ad a dream-like quality. The production company also filmed everything live, so they really did throw 250,000 bouncy balls down a hill in San Francisco. While the ad is great (and we all remember the original) the reality of that situation in real-life is a little different. Tango capitalises on this by showing what it might really be like if all those bouncy balls came cascading down a hill near you. Parody culture is something that has evolved over centuries and now forms a central part of Western humour—and adverts. The popularity of parody has caused many a legal argument and with complicated copyright laws, it can be difficult for brands to tell what they can and can’t get away with (and, conversely, what their fans can get away with!). On the flip side, there’s the admiration aspect to consider: using another artist’s work as a jumping-off point for one’s own shows a level of respect- or at least interest- for the work of the original artist. The original work was memorable enough to make someone want to use recognisable aspects of it. 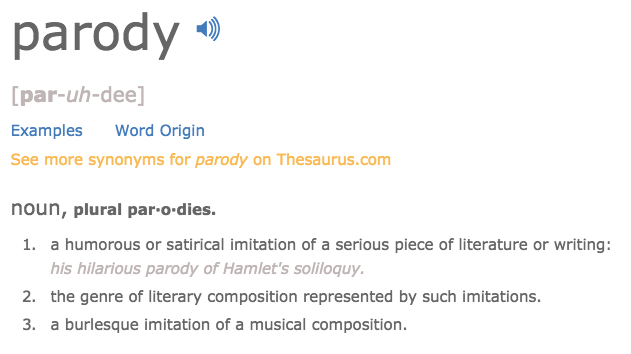 So, is parody the greatest form of flattery? Answer: it depends who you ask.